This entry was posted in Uncategorized on September 20, 2018 by Club Member. Come be a part of the largest Scouting event in the world. Saturday, October 21, 2017, 9 a.m., the Stillwater Amateur Radio Club will be set up at the United Methodist Church bus lot, Duck and 7th Street in Stillwater, Oklahoma. Our licensed Amateur Radio operators will have various stations and antennas on display and set up for use. Local scouting groups will be on hand to share the experience. Some scouts are licensed themselves, and will gain some valuable mentored air time. Scouts, this event is approved for several scouting awards. See additional info in the flyer, below. This entry was posted in Uncategorized and tagged Jamboree On The Air, JOTA, public radio event, scouting on October 4, 2017 by Club Member. 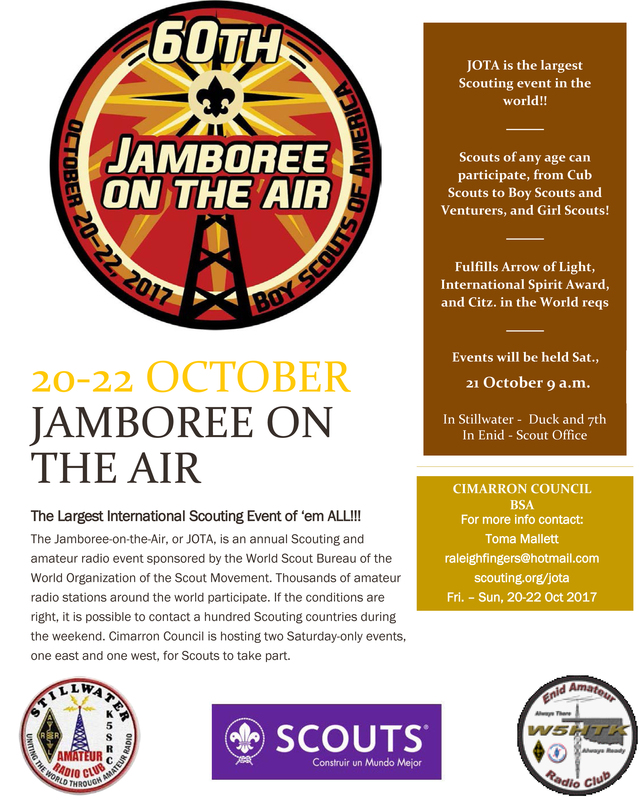 The club as some of you are aware will be participating in the upcoming Jamboree On The Air,October 20th,21st and 22nd 2017. Toma Mallet,International Representative for the Cimarron Counsil joined us for the June meeting last week to talk about JOTA and to asks a few questions concerning Venue and what events might be included and if we would like to present a Radio Merit Badge class. Kevin N0IRW is looking into the recently revised program that ARRL offers for Boy Scouts.Toma would like to include Girl Scouts and is talking with the Girl Scout Counsel Counterpart. At this point we are leaning toward the event being held at the Will Rogers Camp Ground, Cleveland, Oklahoma.Some of you may consider camping out for the entire weekend or join us on that Saturday and or Sunday which will more than likely be the days when most of the activities will happen. Kevin N0IRW suggests that we can offer a merit badge program which can be accomplished over two days, with two hour sessions per day. This can be followed up with a Technicians Class in the coming weeks for those Boy Scouts and Girl Scouts who would like to become Licensed Amateur Radio Operators. Congrats Guys! I’m certain you will serve the club well! And thank you for the privilege to have your trust as the outgoing Secretary/Treasurer. It was an honor to work with Martin WB5AGZ this last couple of years. Four NEW licensed Amateur Radio Operators in Stillwater, Oklahoma! Kevin O Dell, N0IRW, did a great job leading the class. We value his experience and expertise, and thank him for a job well done. The two students who didn’t pass the test are encouraged to study and test again. Having your license is worth it! This entry was posted in Uncategorized on April 24, 2017 by Club Member. Get ready, and plan to attend the 51st annual show of the Oklahoma Steam Threshing & Gas Engine Association, located at Steam Park Grounds, Pawnee, Oklahoma. Dates include May 5, 6, & 7, 2017. Full Schedule of Events is here. Remember, events are subject to change. And follow the Oklahoma Steam Threshing & Gas Engine Association on Facebook. This entry was posted in Club Activities, General Information on March 20, 2017 by Club Member. The SARC meeting location has been changed. Due to accessibility issues, we have changed our meeting location from the Salvation Army to the Lee Company, which is only a couple of blocks away. The meeting time is still 6:30 on the first Tuesday of each month. Click the Meeting tab at the top for directions. This entry was posted in General Information on December 11, 2016 by Club Member. Nelson has made a list of nets he attends and they have been posted here for others to view and participate in them. Click the Local Nets link in the menu. The club will be volunteering by ringing bells and collecting donations for the Salvation Army this holiday season. Jeri has suggested a project. If enough people are interested, we can have the boards made. Click on the Club Projects link in the menu. Suggestions are welcome for other project ideas. This entry was posted in Uncategorized on October 23, 2016 by Club Member.